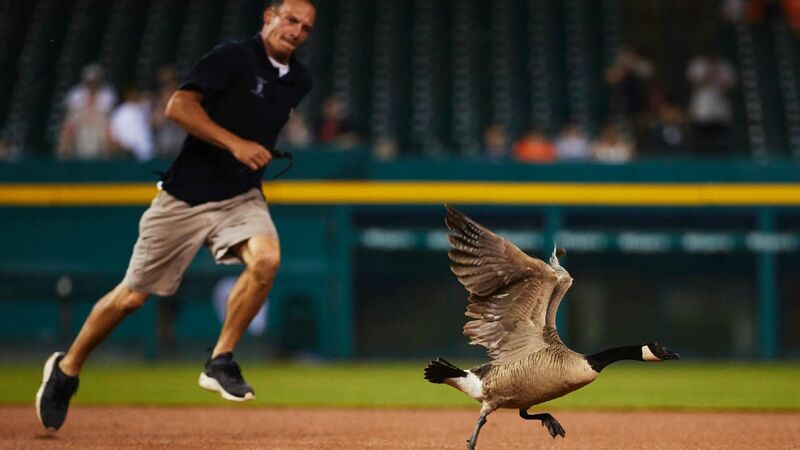 A goose broke loose in Detroit Wednesday night until a scoreboard intervened in Comerica Park. Tiger members tried to evict the goose, but had no luck when entering from the outfield Infield and then flew back into the field. A player for the Tigers also tried, but quickly realized that running in terms of speed can not keep up with flying. The goose took off and flew out of Comerica. There, the fans applauded when the goose made its ascent with the television program Fox Sports West: "There it goes, he is gone, now in the cruise control." In the Air, The Goose was trying to shoot for the breaks when they spotted a big blue scoreboard on the way out of the stadium, but it was too late. The goose slammed against the scoreboard and crashed into the seats below, as the fans, who had been cheering just seconds before, ran out of desperation. The Good News: The goose seemed all right to get up after a fall before being taken off the seats by a Tigers fan.